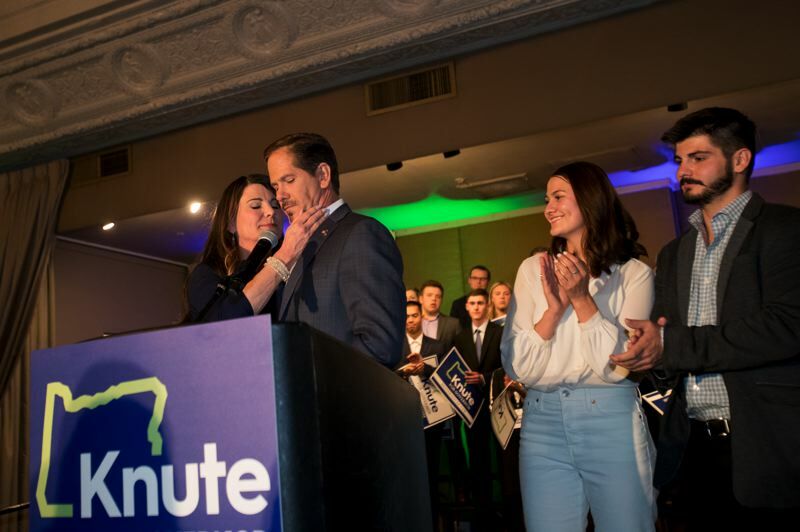 The Democrat defeated Republican state Rep. Knute Buehler, a surgeon and legislator from Bend, in a race that was decided quickly after balloting ended Tuesday night. Her election means a continuing press on environmental issues and on education. With no election ahead of her, Brown faces a term with a firmer hold on the office and less of a need to grasp political advantage. Brown and Buehler spent more than $30 million combined in their bids for Oregon's top desk, noted especially by major donations to Buehler from Nike co-founder Phil Knight. By late Tuesday, elections officials had counted 1.4 million ballots. 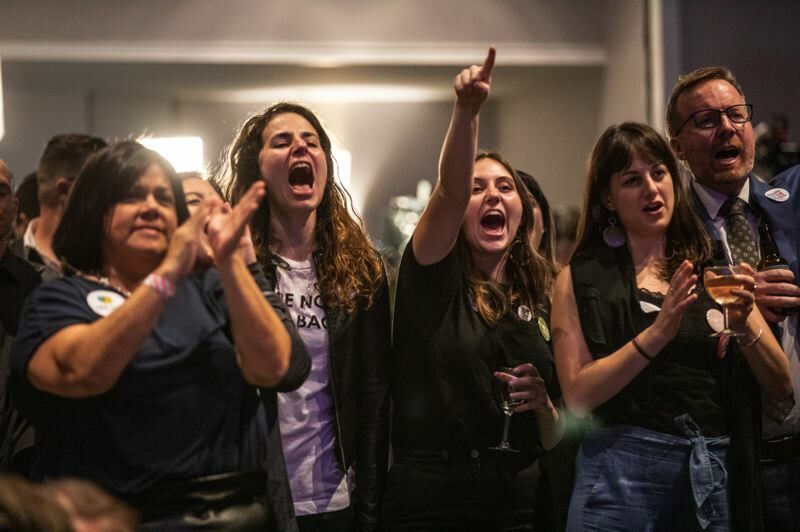 Brown, from a lectern at the Hilton Portland Downtown, told supporters that voters showed how elections in Oregon aren't all about who raises the most money. "No one person should be able to buy the governor's office," Brown said to cheers. Polls closed at 8 p.m. and, although first results trickled in a few minutes later, Brown was declared winner by 8:20. Buehler conceded after 8:30, telling supporters at Portland's Sentinel Hotel that he was as disappointed as they were. "My voice will not be leading this state for the next four years and I certainly accept that decision," he said. "But let's also be very clear: the status quo in this state is not tolerable." Polls leading into November showed the two candidates virtually neck-and-neck. 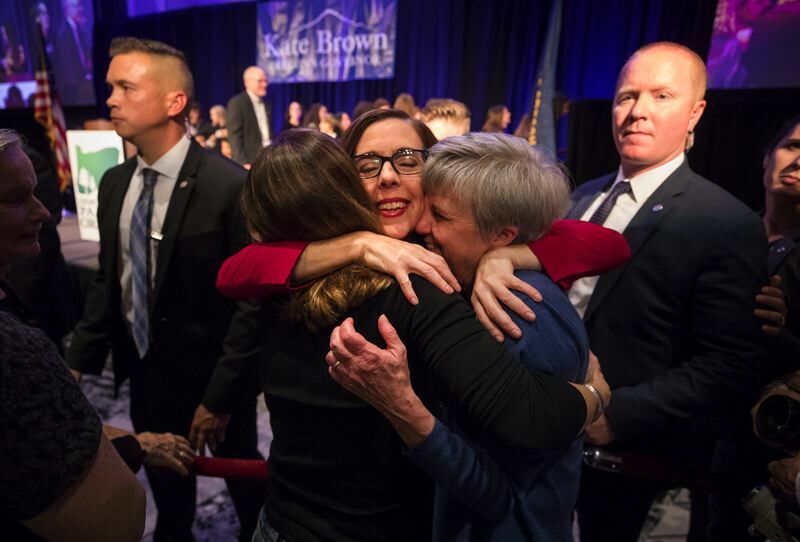 In her nearly 8-minute victory speech, Brown said her stances on education, affordable housing and health care won over Oregonians. "This election shows that when Oregonians are given an opportunity to invest in our classrooms, to build affordable housing, to protect health care, it's not a toss-up. It's not even a close call," she said. But, afterward, Brown conceded she worried it could have been much closer. "I knew the race was going to be close, and thought it would be close all along, but to take this solid of a lead made me really happy," she said. Victory secured Brown her second term as Oregon's governor. She succeeded to the job in 2015 after the resignation of former Gov. John Kitzhaber. Brown, 58, then won a special election in 2016. 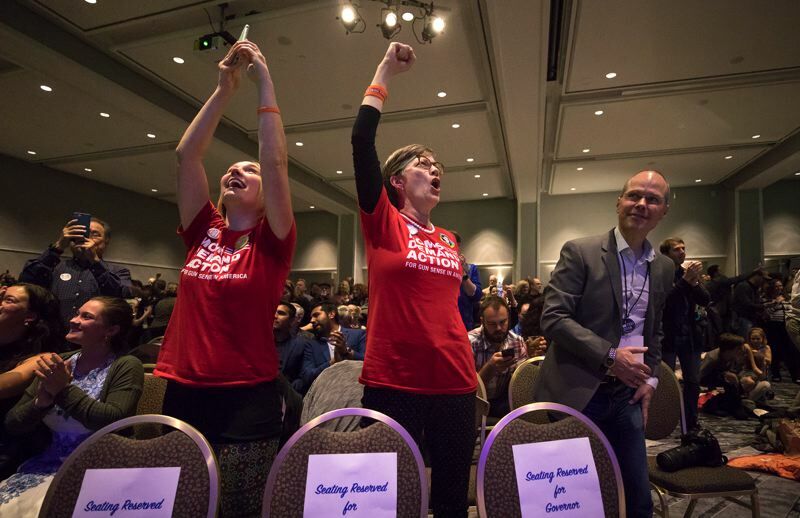 It also secured Brown a governance with a Democratic supermajority, as the party seized at least three seats in the Oregon House by Tuesday night. "It's just really cool to be able to pick up races in the state House and the Senate and really be able to make a huge difference over the next two years in Oregon, and keep Oregon moving forward," Brown said. Brown's victory was lauded by environmental groups and some unions. Doug Moore, executive director of the Oregon League of Conservation Voters, said Brown's re-election kept the climate in good hands. "Climate change was on the ballot, and climate change won with Kate Brown," he said. Joe Baessler, political director for Oregon's American Federation of State, County and Municipal Employees, which represents government workers, said Brown's leadership is better for affordable housing initiatives and public employees. "She didn't get enough credit for it, but she had a litany of great accomplishments," Baessler said, noting that he hoped to see strong progressive policies in Brown's next term. "We have agencies that are barely able to accomplish the tasks they're mandated to because they don't have the resources." "Make no mistake. The fight isn't over. We've still got lots of work to do," she said. "We've never had someone so divisive in the White House or someone with such less respect for the truth or for the people impacted by his decisions." Governing will remain her focus until then. She aims to increase funding for initiatives to bring about more affordable housing and tamp homelessness. "Every Oregonian deserves access to a warm, safe, dry, affordable and accessible place to call home," she said before election night. "Oregon has to step up — states have to step up — when you have a federal administration that is literally ignoring this problem and ignoring science and ignoring realities of what's happening on the ground," she said. 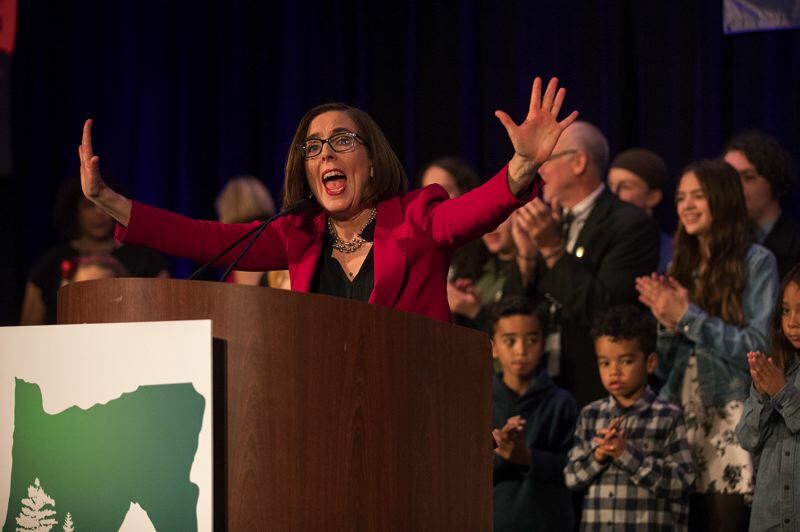 And, after the performance of Oregon's public schools became a hotspot late in the campaign, Brown said she hopes to reinforce education and career training in the state. When asked about legacy policy, Brown pointed to Future Ready Oregon and other programs that offer jobs training and technical skills. "That means closing the skills gap between workforce that we have and the workforce that we need to fuel the economy of Oregon's future," she said. On her upcoming budget, to be released in December, Brown wouldn't disclose much. She said this budget will be easier to balance than last, when the state faced a deficit creeping toward $2 billion. This time around, she said, it's a manageable $800 million, fully due to funding the Oregon Health Plan. During her victory speech, Brown gave special thanks to former governors Ted Kulongoski and Barbara Roberts. "I'd like to say I'm standing on the shoulders of giants," she said. Roberts, who was Oregon's first female governor, said she has been impressed with Brown's time as governor. Brown said she did not have months to craft a budget or legislative agenda in her first term, rather inheriting one from Kitzhaber. "It was very complex, very complicated, very demanding," Roberts said. Brown acknowledged she has a starkly different demeanor than Kitzhaber, who was known for a forceful style of leadership. "I'm not a podium-pounder. That's just not who I am," Brown said. "I think public policy, that is built from the ground-up and not the top-down, is much more effective. It's much more resilient, it's much more respectful, it is much more reflective of our communities." When asked about her first term, Brown pointed to legislation such as motor voter, the Coal to Clean energy policy and women's health care that is being used as a model in states around the country, she said. And her collaborative approach led to the passage of the largest transportation bill in state history. Roberts said Brown has accomplished a lot, despite what some choose to see. "People look at her and see this physically small woman, but her mind is not small," Roberts said. "She is very bright." And while she doesn't plan to slam her fist on a table until the Legislature passes her agenda, Brown said she has learned in her first three years about what it takes to be an effective governor. "They have given me really solid advice, and really helped me keep my chin up in what has been a really tough campaign cycle," she said. "I hope I can provide that to folks in the future, if future elected leaders in Oregon are interested in my advice."